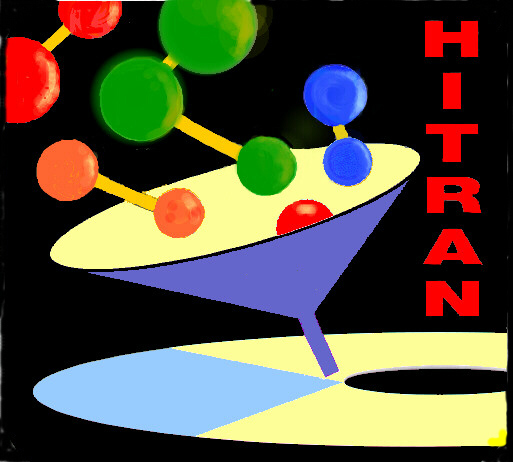 HITRAN is an acronym for high-resolution transmission molecular absorption database. HITRAN is a compilation of spectroscopic parameters that a variety of computer codes use to predict and simulate the transmission and emission of light in the atmosphere. The database is a long-running project started by the Air Force Cambridge Research Laboratories (AFCRL) in the late 1960′s in response to the need for detailed knowledge of the infrared properties of the atmosphere. The HITRAN compilation, and its associated database HITEMP (high-temperature spectroscopic absorption parameters), are developed and maintained at the Atomic and Molecular Physics Division, Harvard-Smithsonian Center for Astrophysics under the continued direction of Dr Laurence S. Rothman. For more information visit this website [http://www.cfa.harvard.edu/hitran/]. The simultaneous developments of high-resolution laboratory instrumentation (such as the Fourier transform spectrometer), the digital computer and storage, and sensitive detectors and the means to carry them on board high-altitude balloons and space craft provided the stimulus to create a machine-readable archive of the fundamental properties of molecular transitions. It was then possible to simulate transmission and radiance in the terrestrial atmosphere by applying known radiative-transfer equations. Thus was born the original HITRAN molecular absorption line parameters database. The initial HITRAN was limited to the seven main telluric atmospheric absorbers in the infrared: H2O, CO2, O3, N2O, CO, CH4, and O2. The most significant of the isotopologues of these molecular species was also included. The initial HITRAN database included only the basic parameters necessary to solve the Lambert-Beers law of transmission, namely the line center of a transition, the intensity of the transition, and the lower-state energy. In addition, the air-broadened Lorentz width was included as well as the unique quantum identifications of the upper and lower states of each transition. Before long, the objectives of HITRAN greatly expanded. The spectral range of applicability soon covered the microwave through visible region of the electromagnetic spectrum. In terms of physics, that meant transitions of pure rotation as well as ro-vibration (and even some transitions between different electronic states). The applications also went beyond the simple atmosphere, and many molecules were added that represented trace species in the atmosphere and pollutants in the troposphere. More recently, HITRAN has served the planetary atmospheres community. As a result, the transitions in the database have incorporated more basic parameters, especially those that allow simulation of collisional broadening of spectral lines. The current and planned remote-sensing satellite missions had also put new demands on HITRAN for precision and accuracy. The line positions and intensities are being acquired at unprecedented accuracy. The goal of HITRAN is to have a self-consistent set of parameters. However, at the same time the requirement is to archive the most accurate parameters possible. It must be emphasized that the parameters that exist in HITRAN are a mixture of calculated and experimental. Often the experimentally determined values are more accurate than the calculated ones, and vice versa. The calculated values have certain advantages, for example providing a more complete set. But the experimental ones still are usually more accurate. HITRAN provides the sources for the key parameters within each transition record whereby the user can determine from where the value came. The experimental data that enter HITRAN often come from the results of analysis of Fourier transform spectrometer laboratory experiments. Many other experimental data also are inputted, including lab results from tunable-diode lasers, cavity-ring down spectroscopy, heterodyne lasers, etc. The results usually go through elaborate fitting procedures. The theoretical inputs include standard solutions of Hamiltonians, ab initio calculations, and semi-empirical fits. Another aspect of HITRAN is that when line-by-line transition parameters are either not available, or not practical, we provide experimentally-determined cross-sections at different temperatures and pressures. This part of HITRAN can be used for quasi-physical radiative-transfer solutions. Examples of these molecules are anthropogenic gases including the chlorofluorocarbons, large molecules, etc. Collision-induced absorption parameters for many binary collisions are also provided. These data are being built upon, and are very useful for modeling of planetary atmospheres.